Your enjoyment of Chappie will depend entirely on how high a premium you place on originality. The film’s influences announce themselves loudly and proudly; if you’ve seen Short Circuit, Short Circuit 2, and RoboCop, you have seen Chappie, or at least you’ve seen its skeleton dangled from a hang-up stand á la Budget Bart. But you haven’t seen this movie as directed by Neill Blomkamp, the wunderkind behind District 9 and the admittedly disappointing Elysium. Sniffing out Chappie’s reference points might offer diverting geek amusement, but pedantry paints only a partial picture of what Blomkamp does with his well-worn conceit. For as many riffs on Frankenstein’s monster as cinema and literature have to offer, none of them feature the South African hip-hop group Die Antwoord. (If you don’t know Die Antwoord, try watching their videos sober—you’ll be put under the immediate impression that someone has spiked your cup of tea with hallucinogens.) Chappie isn’t quite Die Antwoord: The Movie, but members Watkin Tudor “Ninja” Jones and Yolandi Visser play such major roles in the film that anyone averse to their hyperkinetic, unapologetic zaniness may struggle with Blomkamp’s take on Shelley. Here, Ninja and Yolandi play themselves—or versions of themselves from a not-too-distant future—who actually live the hard-knock life their music inhabits. They’re in debt to a brutish crime lord in Johannesburg who gives them a week to repay him on pain of death. As with District 9, Joburg is treated as a backdrop of urban decay, but this time Blomkamp uses fears of a militarized—though perhaps the more precise term is “mechanized”—police as part of his pastiche rather than Apartheid allegory. Johannesburg’s law enforcement has been stocked with nigh-invulnerable automatons that are produced by weapons company Tetravaal and designed by robotics genius, Deon (Dev Patel), whose latest innovation—experimental AI—has been quashed by his superior, Michelle Bradley (Sigourney Weaver). Chappie positions Deon, Ninja and Yolandi as its principals, so as Blomkamp makes introductions we know that these three people have to collide with one another eventually, and collide they do: Ninja and Yolandi decide to kidnap Deon in hopes that he can help facilitate a heist, the proceeds from which they’ll use to square things up with their boss. When they do shanghai the poor sap, they find that he’s made off with a broken down robot from Tetravaal in hopes of installing his groundbreaking AI on it. Thus is born Chappie (Sharlto Copley), a learning machine with thoughts and feelings of his own and whose existence is in jeopardy from the moment he’s activated. Trailers for the film suggest an action rumpus. They’re not wrong, but they are misleading; Blomkamp hews closer to comedy than action, and closer to speculative sci-fi than either. Much like District 9, Chappie also reserves most of its masterfully orchestrated violence for the finale, putting heavy emphasis on development of characters and themes in the interim. 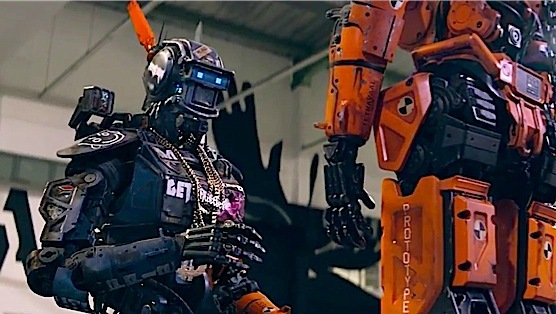 Chappie’s upbringing provides the center for the picture’s first couple of acts as the unlikely trio of protagonists bicker over how best to raise him. Yolandi immediately adopts Chappie as her surrogate son, playing the loving, nurturing mommy to her growing chick. Ninja, best described as Wile E Coyote by way of Public Enemy, thinks she’s too soft on Chappie, and attempts to fashion him as a robo-gangster. Deon, meanwhile, is obsessed with the “inventor/invention” dynamic and initially lacks an emotional bond to the android. They’re a patchwork family, and their interactions are one of Chappie’s best recommendations, though Yolandi is so close to amazing that her scenes with Copley’s stunningly lifelike mo-capped creation shine brightest. As the film’s domestic drama unfolds, threats seen and unseen slowly converge on our heroes. Chief among these is Vincent Moore (Hugh Jackman), Deon’s bible-thumping Tetravaal rival and designer of the “Moose,” a towering war mech that’s the very definition of “overkill.” Moore is the architect of the film’s conflict and an all-around creep, kind of like a warmongering Aussie version of Ned Flanders. Vincent despises the notion of artificial intelligence, and his closed-mindedness provides the film with a springboard for Blomkamp to explore definitions of humanity. (In that respect, it’s sort of a spiritual sequel to District 9.) The results aren’t subtle, but subtlety has never been Blomkamp’s bag. Is Chappie alive, or is his consciousness just puppetry? As he engages with the world around him thanks to FX magic (courtesy of Animatrik Film Design), we figure out the answer before the question is properly posed and the narrative delves into late-stage existentialist mind screws. There’s a director’s cut of Chappie waiting to be put on an eventual Blu-ray release that could smooth out the film’s rougher edges. For all of its emotional punch, the whole thing is sort of a choppy mess. For now, the picture suggests a reinvigorated Blomkamp following the clumsy disaster of Elysium, a movie left empty in part by Hollywood’s creative vacuum. The film’s familiar pieces are ultimately used to fulfill his personal interests instead of soullessly crib from other genre touchstones. This is a movie where a God-fearing sociopath wages war on artificial intelligence and budding transhumanism. We’re not exactly talking about straight up charlatanism here, and Blomkamp wields such command over both his inspirations and his own designs that Chappie feels like an act of daring rather than of fraud. But the robot works, and so, too, does Blomkamp’s movie.